Peugeot became the official car — and one of the official sponsors — of the well-known Roland-Garros tennis tournament in 1989. It introduced a special edition of the 205 that same year in order to capitalize on the partnership. 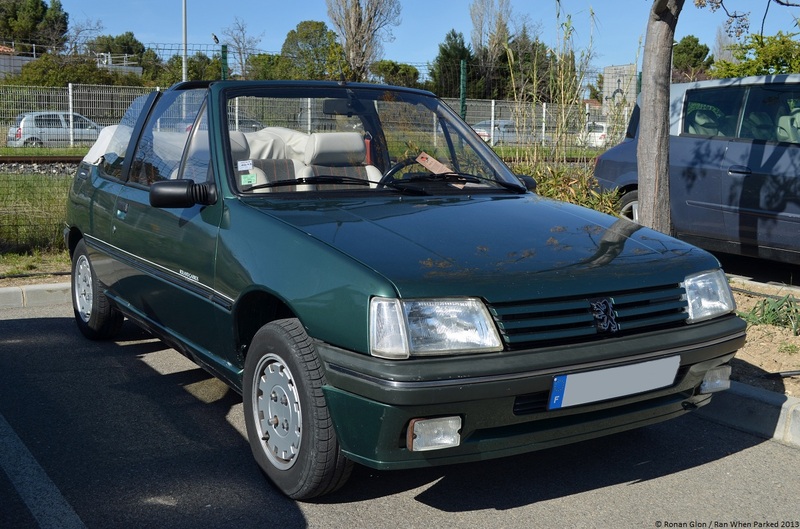 Only available as a three-door hatchback and as a two-door convertible, the Roland-Garros was positioned near the top of the 205 hierarchy. Both body styles were offered exclusively in a model-specific shade of dark green, and they were fitted with special 13-inch alloy wheels. They were instantly recognizable from other members of the 205 lineup thanks to Roland-Garros stickers on both doors, and an emblem on the right side of the trunk lid. The convertible came with a white soft top, which provided an elegant contrast with the dark green paint, while the hatchback was fitted with a large sliding moonroof. The front passengers were treated to sport seats upholstered in white leather with gray, red, and green inserts. The long list of standard features included tinted windows, power front windows, and a cassette player, equipment that created an upmarket ambiance rarely found in the 205’s segment at the time. The niceties also helped justify the Roland-Garros’ relatively high sticker price. The finishing touch inside the car was a Roland-Garros emblem on the three-spoke steering wheel. Both models used a carbureted 1.4-liter four-cylinder engine that was also found under the hood of the 205 XS. Bolted to a five-speed manual transmission that spun the front wheels, the mill made 85 horsepower and 85 lb-ft. of torque, enough to send the hatchback from zero to 62 mph (100 km/h) in 10.6 seconds, and on to a top speed of 110 mph (177 km/h). The convertible was a little slower, hitting 62 mph in 11.4 seconds and topping out at 108 mph (173 km/h), due to the extra weight. The Peugeot 205 Roland-Garros was phased out after the 1992 model year. The Roland-Garros treatment was applied to other members of the Peugeot lineup over the 1990s and the 2000s, including the 106, the 306, the 206, and more recently the 208. Tags: Peugeot, Peugeot 205. Bookmark the permalink.